A few weeks ago, I attended a seminar led by Kevin Zraly at the New York presentation of the importer Kobrand’s annual Tour d’Italia. This showing of Kobrand’s line of Italian brands was open to the wine trade and media. The seminar was available only to wine media members, and organized around a selection of Kobrand’s major Italian producers – Pighin (Friuli), Silvio Nardi (Tuscany), Michele Chiarlo (Piedmont), Nozzole (Tuscany), Sette Ponte (Tuscany), Masi (Veneto), and Medici Ermete (Emilia Romagna). Have you noticed that nothing is selected or organized any longer, but everything is curated? Well, the wine world isn’t exempt from that kind of verbal hyperventilation. What is called a seminar these days (and not just by Kobrand: It’s universal) is simply a panel of producers talking a bit about their estates and the representative wine they’re showing. And the wines at this event and the larger portfolio tasting of which it was part aren’t just fine wines or even great ones: These were “The Icons of Italian Wine.” Icons is a vastly overworked word, but what puts this phrase over the top for me is the definite article: The icons – there can be no others. Give me a break, please. OK, so I’m tilting at windmills again: I’ll dismount and get back to the wines. Which weren’t bad at all. Some not my style, but well made of their kind, true to their varieties and to the winemaker’s vision. Some very good, drinkable young and worthy of some aging. And at least one just remarkable: This was Masi’s Costasera Amarone Riserva 2009, which already tasted lush and lovely and which promises to be off-the-charts gorgeous in 20 years. The presentation of these wines was very honest and straightforward, lacking the kind of hyper-seriousness foreboded by “icons” and “seminar.” Kevin Zraly is an old pro at events like this: He kept things lively, interesting, and moving at a good pace; and he allowed plenty of time for questions – of which there were almost none. The few there were could have come from civilians, not wine professionals. So my big disappointment at this event was not with the wines or their presentation, but with what we used to call the press corps and now have to denominate the media. They seemed totally content with the basic information being offered: no questions, no remarks on what they were tasting, no burrowing for technical data. That’s like writing an article entirely from the press handouts. It made me nostalgic for the guy who always used to ask about pH and reverse osmosis and then endlessly argue with the winemaker about the truth/accuracy of what he was saying. At least that guy cared, and he had some core of knowledge against which to weigh the winemaker’s claims. I got no sense of any of that in this session – which is seriously too bad, in many respects. and Chiarlo’s 2013 Barolo Cerequio, a very elegant, balanced wine that the maker compared to the outstanding 2004 vintage. Also quite interesting was Sette Ponte’s 2016 Oreno, a Tuscan IGT Bordeaux blend (Merlot, Cabernet sauvignon, Petit verdot), a wine big in the mouth, rich and fat, with splendid Italian acidity, bigger than the Bordeaux wines it’s modeled on, with more fruit and more enlivening acid. I’m no fan of Bordeaux grapes in Italy, but this is a good wine. Barbera is a wonderful wine, versatile and enjoyable and affordable. Perhaps the wine’s greatest virtue is how well it plays with all sorts of dishes, so when Diane and I find ourselves trying a new recipe – a pretty frequent occurrence here, given Diane’s weekly food posts – and uncertain what wine will pair with it, Barbera is often our go-to grape. Lots of people, both consumers and growers, love Barbera: It’s one of the most widely planted varieties in the world and stands third among red grapes in vineyard space in Italy. From the grower’s point of view, Barbera has many virtues: It thrives in all sorts of conditions, bears heavily – sometimes too heavily – and almost invariably yields a wine that is at worst quaffable and usually much better than that. From the wine drinker’s point of view, Barbera’s rich, dark color, its bright fruitiness – usually described as some variety of cherry – and its zingy, lively acidity make it a delight at dinner. And it hardly hurts that most Barberas are inexpensive: It rates very high on the pleasure-for-dollar scale. Outside of the Italian Piedmont, Barbera has become a workhorse variety, used frequently to blend with other varieties that need a splash of color and a jolt of acidity to brighten them. 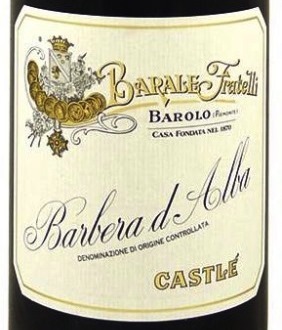 It was even customary to use it that way with the austere Nebbiolo grapes in prestigious Barolo and Barbera. But the workhorse can turn into a thoroughbred when it’s planted in the right places and treated with respect. Giacomo Bologna was the first to make that clear in 1985, when he released the first vintage of his then-iconoclastic, now-iconic Bricco dell’Uccellone, a monovarietal Barbera aged in barriques. That wine, still made by his family on their Braida estate, showed for the first time how much breed and finesse Barbera possessed and began the trend toward treating Barbera as the noble grape it apparently is capable of being. Naturally, many winemakers immediately went too far with this process – siamo in Italia! They over-extracted and over-oaked their grapes and worked very hard to diminish, if not entirely remove, Barbera’s acidity, which for many wine lovers was and is the defining characteristic of the variety. So for some years in the 80s and 90s, it became far too easy to find bad Barberas, wines wherein the grape’s lovely cherry flavors were submerged in a sea of oak-derived vanilla or toast or even coffee, and the wine de-acidified to the point of flabbiness. There are still a few of those around, but sanity has returned to most Barbera producers, and the vast majority of Barberas are once again bright, fruit-enlivened wines of charm and grace. For all that Barbera is planted so widely, I have been talking here primarily of the Piedmontese wine. 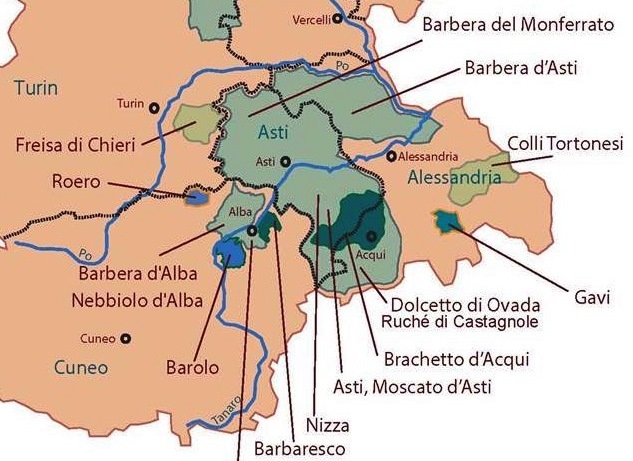 That’s because around Alba and in the province of Asti and the Monferrato hills, Barbera attains its best flavors and highest levels of quality. This a little odd, because Barbera is entirely unrelated to any other Piedmontese variety. In fact, no one really knows where it came from. 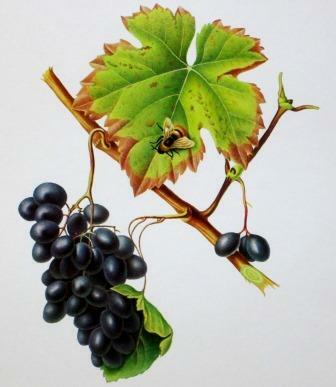 The earliest reference to what seems to be the grape we know occurs in the very late 18th century in the Monferrato area, but even that reference is uncertain. 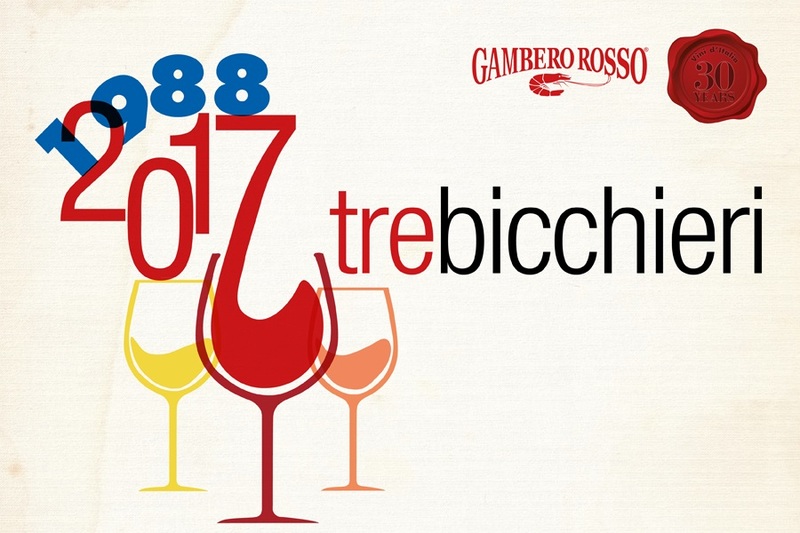 What is sure is that Barbera came into its own after the devastations of phylloxera, when the great majority of Piedmont’s vineyards had to be replanted, and it hasn’t looked back since. Alba, Asti, and Monferrato can now be considered its heartland, and all three produce outstanding wines. Asti’s are the brightest, lightest, most acidic, and at their best the most elegant. 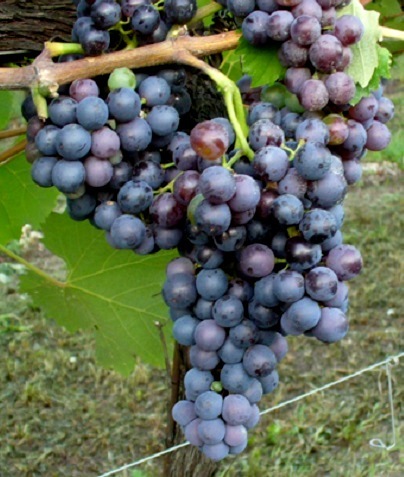 Alba’s Barberas are fuller-bodied and more intense, with a bit more tannin showing. Asti makers think Alba’s wines are a bit rustic and “nebbiolized,” and they may be right – though both those qualities can be virtues. The Monferrato versions tend to combine the best traits of both other areas, and they can, at their best, be stunning wines, but they are the hardest to find on this market. Over the years, I have drunk excellent Barberas from many great producers. Here is a very short list of the best. Please bear in mind that most of them make several versions of Barbera – multi-vineyard, single vineyard, selected vineyards, old vine, barriqued and not barriqued, et cetera – and their varying price levels usually indicate how the makers regard them. You may or may not agree: I find with Barbera that simpler is often better. 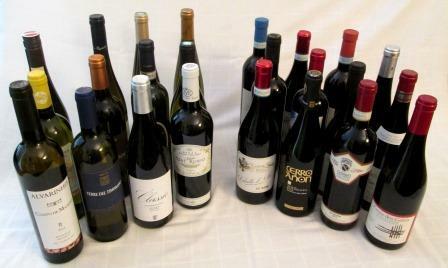 Any bottle from this array of star producers ought to provide a Barbera novice with a fine introduction to the breed; a tasting of several of them should show the range of styles and nuances the grape and its zones are capable of. Go to it, and enjoy! Alessandro Masnaghetti has probably devoted more time and attention to Barolo – both the wine and the territory – than any living human being. 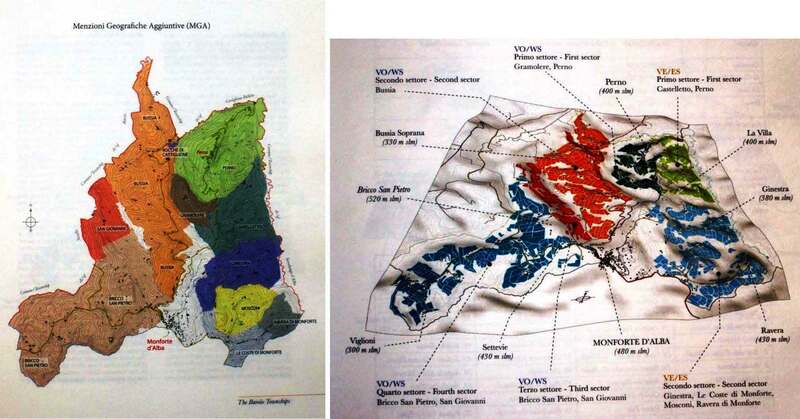 His maps of the vineyards of Barolo (and Barbaresco, to be sure) are matchless in their detail and information, as well as in their visual appeal. 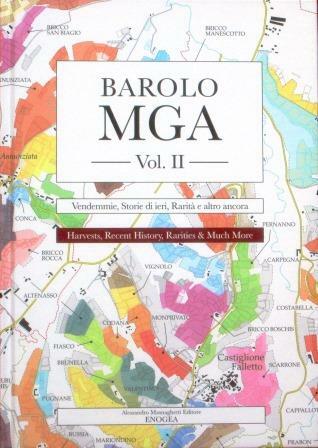 Now he has released volume II of his magnum opus, Barolo MGA. Volume I appeared a few years ago, in 2015. The MGA of the title refers to the menzioni geografiche aggiuntive, the additional geographic names that may now be added to Barolo wine labels. The book is very accurately subtitled “The Barolo Great Vineyards Encyclopedia.” Volume II, equally accurately subtitled “Harvests, Recent History, Rarities, and Much More,” has just joined it. Both are large, substantial books – 12” by 8.5”, about 4 pounds apiece, a total of about 700 fact-, map-, and graph-filled pages – in every sense of the words, hefty tomes. (Daniel Thomases has done a splendid job of translating both volumes.) These books are not meant for the casual wine sipper, but for those passionate enough about Barolo to want to know as much as can be known about it. If it’s factual and relevant to Barolo, it’s in one or the other of these two volumes. No subjective tasting notes, no myths or public relations prose: just the facts of vineyard locations and plantings and weather, growth patterns and harvests, for vintage after vintage. There are comparisons of what the Barolo communes were like in 1970 and what they are now, how much that used to be forest – or Dolcetto vineyards – is now Nebbiolo, or hazelnut groves. There are reprintings and translations of crucial historical documents: Lorenzo Fantini’s Monograph on the Enology of the Province of Cuneo (1879), the Guida Vinicola per la Provincia di Cuneo (1903), and Ferdinando Vignolo-Lutati’s On the Delimitation of Typical Wine Zones (1929), for example. 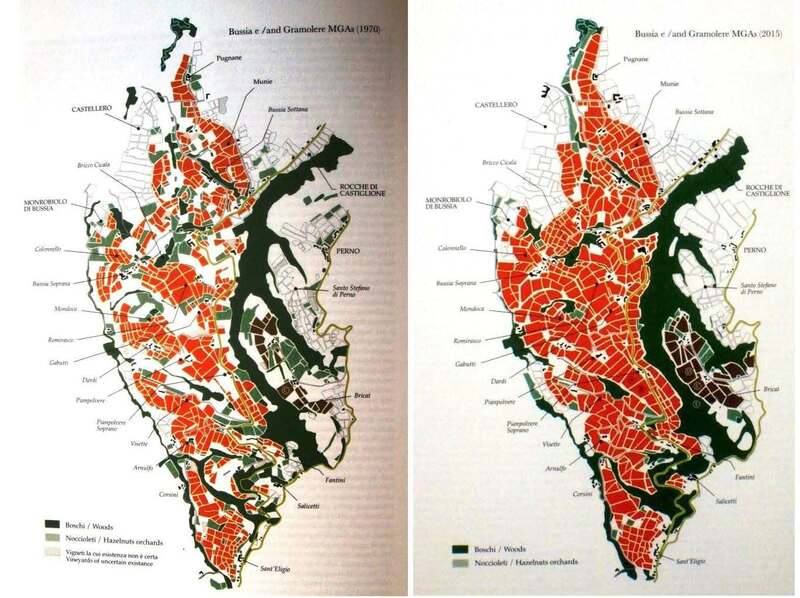 And there are maps and charts without number: for example, these from Volume II, showing the Bussia and Gramolere MGAs as they were in 1970 and as they were in 2015:. It’s all like that, filled with the kind of detail and information that I wish had been available to us decades ago, when I was beginning my own explorations of the landscapes and wines of Alba. If Masnaghetti had done nothing in his life but these two volumes, they would constitute a magnificent career. Below and alongside the village of Cerrati lie the vineyards of Cucco and Posteirone.… Cucco used to belong to Dottor Giuseppe Cappellano, a celebrated figure in the world of Barolo, who was quick to acquire this superb plot when the opportunity arose. It is on the eastern flank of Serralunga and Nebbiolo has always been at home on its white, tufaceous soil. The grapes yield a Barolo with outstanding structure, capable of aging in the cellar for many years. 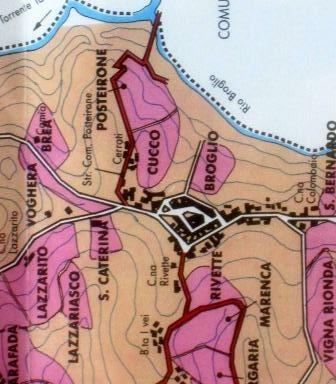 In the more recent and highly detailed Masnaghetti maps of the crus of Barolo, the cellars of Cascina Cucco are listed, but the cru designation Cucco has disappeared from the map. As successive owners of the vineyards ignored the Barolo boom and essentially neglected their vineyards, the reputation of its wines faded and it apparently slipped from the collective wine consciousness, a classic instance of sic transit gloria mundi. Fast forward to 2012, when the Rossi Cairo family acquired the property. The Rossi Cairos had for more than a decade been producing excellent Gavi on their biodynamic, Demeter-certified vineyard La Raia, and they saw a wealth of potential in the splendidly located Cucco site. From what I know of the land situation in the Barolo and Barbaresco zones, properties like this are very rarely available, so the family was wise indeed to leap at the opportunity. 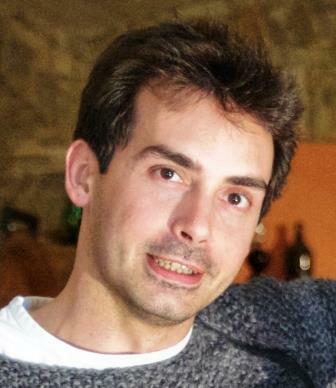 Realizing the need for direct involvement in anything as complex as a Barolo-producing estate, Piero Rossi Cairo, the son of the new owner, gave up his legal career, began educating himself about enology and vineyard management, and assumed responsibility for beginning the newly renamed Tenuta Cucco’s conversion to organic and eventually biodynamic production. Two weeks ago, Piero and his importer, Vinifera, hosted a tasting and luncheon here in New York to introduce the family’s wines. It was clear from the start that Piero was no dilettante winemaker. 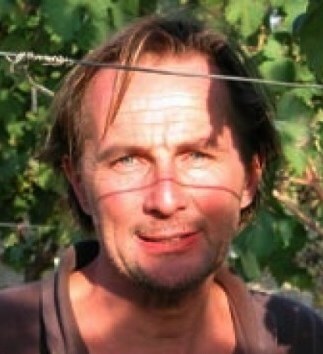 He is passionate and knowledgeable about the organic approach to grape-growing, both its virtues and its limitations. And he spoke warmly of his neighbors, particularly of Franco Massolino of the bordering Massolino estate. I know from my own experience that in addition to the excellence of the wine he makes, Franco knows as much about Barolo as any grower in the zone, and he is as open and generous with his knowledge as any newcomer to the zone could possibly hope for. The Rossi Cairo family bought far more luckily than they realized when they acquired Cucco. 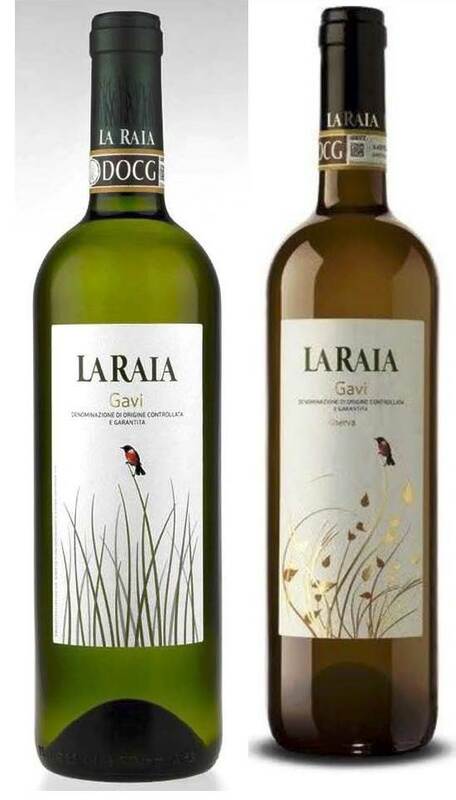 Piero showed seven wines that day, starting with two Gavi: La Raia 2015 and La Raia Riserva 2015. These were two fine whites, the regular bottling light, soft, and fresh, with light citrus and melon fruit, and the Riserva strikingly different. It seemed much more intense, with a fat, buttery, white fruit nose and a palate that followed through point for point: very smooth and buttery in the mouth, with a very long finish. Neither wine saw any wood – stainless steel throughout – but the Riserva came from 60- to 70-year-old vines, and its must stayed on the lees for a year, hence that pronounced butteriness. I thought them both impressive. 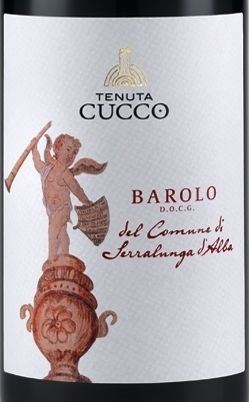 The basic Cucco Barolo 2013 came next, and it showed very characteristically of Serralunga Nebbiolo – black cherry, tar, and tobacco on the nose, in the mouth abundant but soft tannins riding alongside black cherry, earth and mineral notes, with another very long finish. 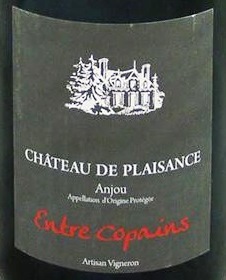 This wine received a prolonged maceration on the skins – 25 days – which may account both for the softness of its tannins and the richness of its flavor. 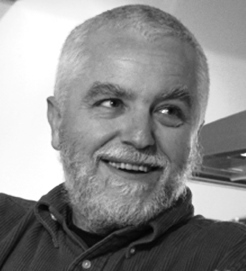 Piero and his family had little role in the growing of Cucco Barolo 2012, but were largely responsible for its handling in the cellar. This was an impressive wine, similar in general to the 2013, I thought, but markedly more intense, especially in the aroma. On the palate, I found it soft and accessible, beautifully balanced, and already drinking very enjoyably, with a long licorice-and-black-cherry finish. In short, a lovely wine. The cru wine, 2012 Barolo Cerrati, spent some time in French barriques, but I detected no oakiness in the wine – just the classic Barolo black cherry, earth, mineral, and underbrush. It was smooth on the palate, with evident tannin that needs a little time to soften. But the flavor package was classic: black cherry, earth, and mushroom, with a long, rich, black fruit finish. This is an excellent wine that will evolve and open for years yet, maybe decades. Piero also showed two older wines, vinified well before the Rossi Cairo family’s acquisition of the estate, to show us what had attracted them to it. The 2007 Cucco seemed a good, sound middle-range Barolo in both heft and quality, while the 1995 was very elegant, very graceful and balanced, while still in no way big. Lovely wines on a sort of smallish Barolo scale. But heft and authority will come, I think, with more attentive field work of the sort the family has already begun, so the future for this once-famed site seems bright indeed. For an old Barolo lover, it is a pleasure indeed to witness this sort of resurrection in progress. Some formal dinners are memorable because of the food, some because of the wine, and some because of the occasion. The recent Chiarlo Double Anniversary Dinner sponsored by Kobrand at Casa Apicii in New York’s Greenwich Village did the hat trick and scored on all three counts. 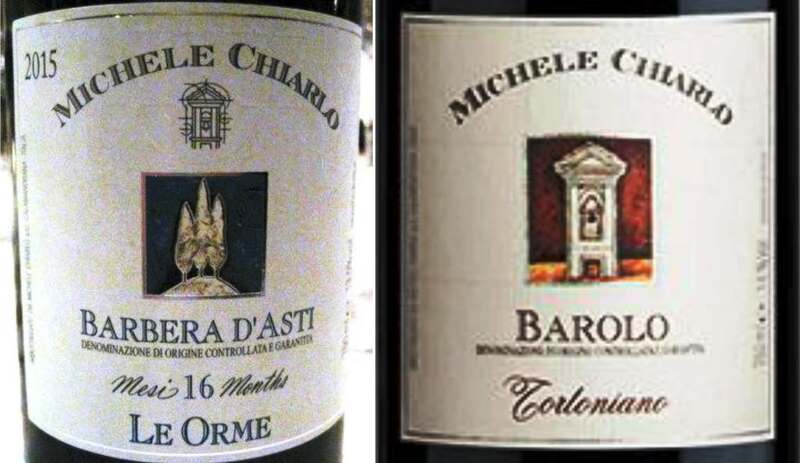 Michele Chiarlo, one of the trailblazing generation of Piedmontese winemakers, celebrated his 60th harvest and his 40th year of being imported to the US by Kobrand by presenting a fine tasting of the Barbera and Barolo for which he is famous. He capped that with a dinner in which the chef Vincenzo La Corte from Chiarlo’s estate hotel, Palas Cerequio, teamed with chef Andrew Bosi of Casa Apicii. Together, they presented a classic Piedmontese meal adorned with Alba white truffles and culminating with braised veal cheeks accompanied by a glorious and utterly appropriate on several counts 1978 Chiarlo Barolo. I count myself very fortunate to have been among the handful of journalists present. In his preliminary remarks, Michele Chiarlo surveyed the many changes he has seen since he took over from his father in 1958. As he rightly said, Italian wine the late 50s and early 60s was a very different world. Emphasis everywhere – even in the Piedmont, now seen as the pinnacle of Italian quality wine production – was on quantity: making a lot of wine to sell fast and cheap. Only gradually did the situation evolve, as attention turned to reducing yields and raising quality, and only gradually did the technology that is now taken for granted enter the Piedmont: stainless steel, temperature-controlled fermentation, establishing phenolic ripeness before harvesting, crop thinning. That last was the most difficult. It was initially regarded as scandalous to throw away good grapes. But Chiarlo and others like him persisted. His fellow attendees at the University of Torino’s enological school are a roll call of the pioneers of quality Italian wine; e.g.,Renato Ratti, Ezio Rivella, and Giacomo Tachis. In addition to his early emphasis on quality, Chiarlo’s great technical innovation was the achievement of malolactic fermentation in Barbera, which had long been considered impossible. 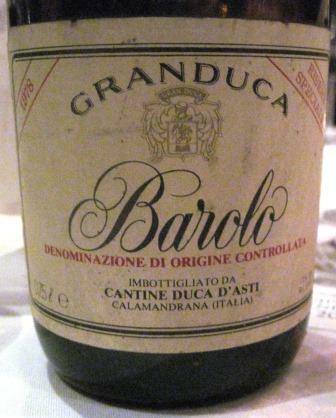 But with the help of the enology faculty in Beaune (it was a visit to Burgundy that prompted him to try this), he found a reliable method for inducing malo with Barbera – and this, as Chiarlo rightly said, created a renaissance for Barbera, making it the satisfying wine for all foods that it is today. 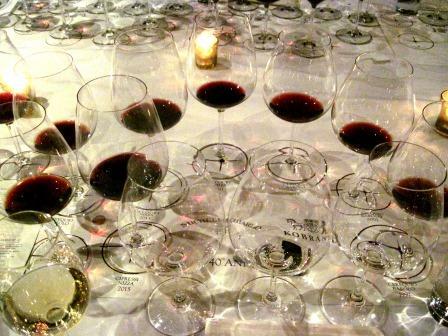 After his remarks, attention turned to tasting the wines. 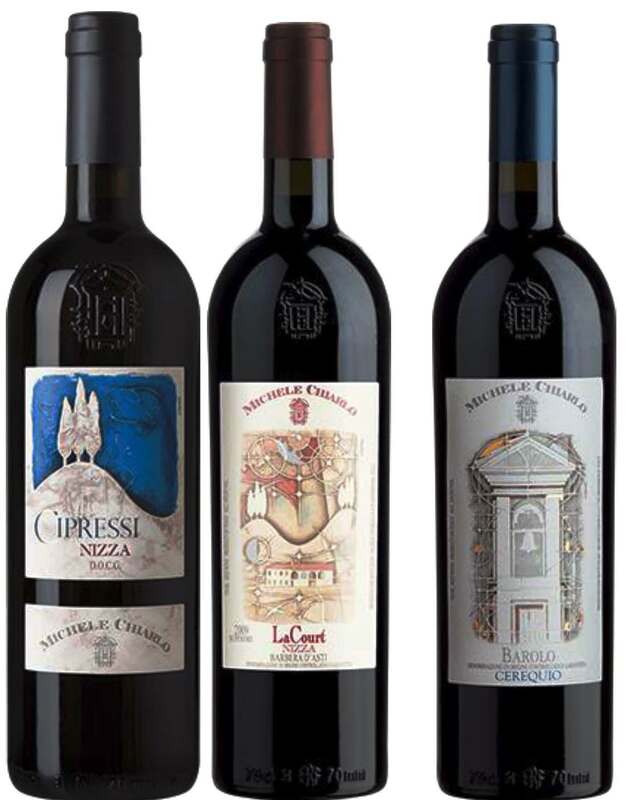 First, three Barberas: Nizza DOCG Cipressi 2015, Nizza DOCG La Court 2013, and Nizza DOCG La Court 2011. The youngest showed a grapey, blackberry nose: It was smooth and velvety in the mouth, with pleasing blackberry fruit and excellent acidity, with fine balance – a thoroughly enjoyable wine. Stylistically, the other two wines followed suit, while displaying deeper flavors and greater elegance. The 2013, a year of fabulous weather, may have been the best: It certainly seems to promise long life at a peak of drinkability. 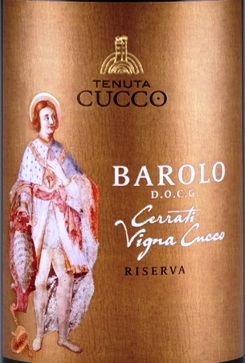 Then came three vintages of Barolo Cerequio – 2013, 2001, 1997. 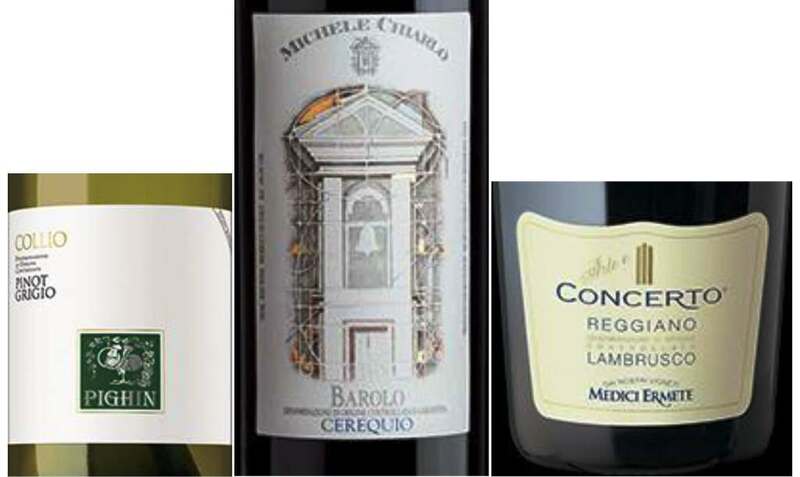 All three were superb vintages, and Cerequio is one of the great crus, lying midway between La Morra and Barolo. Chiarlo farms nine hectares of it, but uses only two parcels for the cru bottling. The 2013 had a deep, earthy, woody, black fruit nose and tasted cherry/berry on the palate, with lovely acid/tannin balance – an elegant middleweight. Though 12 years older, the 2001 seemed lighter, brighter, and fresher, beautifully balanced and elegant. Chiarlo has always striven for elegance, and these Barolos showed how well he has achieved it. The 1997 stood midway between the other two wines in all respects. This vintage at the time was trumpeted as a wonder, but recently I’ve tasted a lot of 97s from other producers that have already begun to fade. Not this one, however: it’s still lively and seems to have many years before it. After a small pause – a chance to refresh our palates with a glass of Taittinger Comtes de Champagne – we arrived at dinner and its much-awaited white truffles. 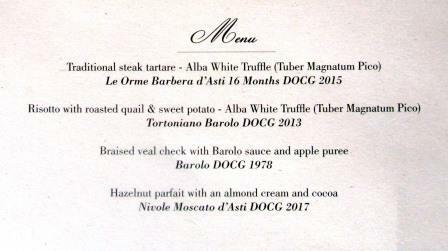 No disappointment there, and none with the wines, which played up splendidly to the truffles’ intense aromas. The Barbera d’Asti DOCG 2015 Le Orme was simply splendid, for my palate the best Barbera of the evening, and in its clarity of Barbera character a benchmark for the breed. The Barolo DOCG 2013 Tortoniano worked beautifully with one of the best risottos I’ve eaten: The harmony of this match was excellent. Finally, the 1978 matched perfectly with the richness of the veal cheek. This was the wine of the night, and it deserved its climactic position. I remember (I know I’m dating myself) when the ‘78s were first released, it seemed as if they would never be ready to drink, so hard and closed were they. Well, they are at last ready, and this one at least was glorious, with all the character, complexity, and depth one looks for in Barolo, and with – apparently – years, if not decades, of life still before it. A fantastic accomplishment, and a fitting cap to Michele Chiarlo’s anniversary feast. A far less joyous note: Another Piedmont pioneer has passed away. 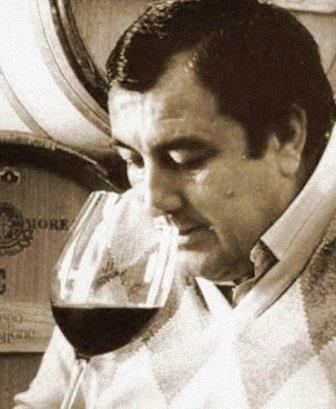 Bruno Giacosa, famed for his Barolo and Barbaresco, especially his cru riservas, died peacefully on January 22. Sit terra levis tibi, Bruno. I wouldn’t be surprised if many of my readers, even those conversant with Italian wines, are scratching their heads about these two names. They’re not exactly common currency. 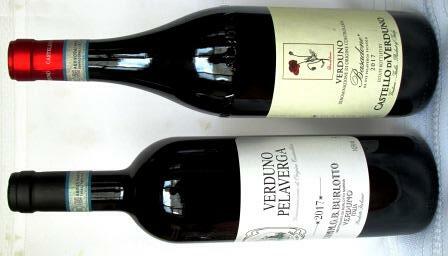 Nevertheless, they’re worth knowing about: They are both intriguing wines, and I think their moment may be coming. Erbaluce and Timorasso are natives of the Alta Piemonte, grown nowhere else. Both used to be much more widespread before phylloxera destroyed many vineyards. 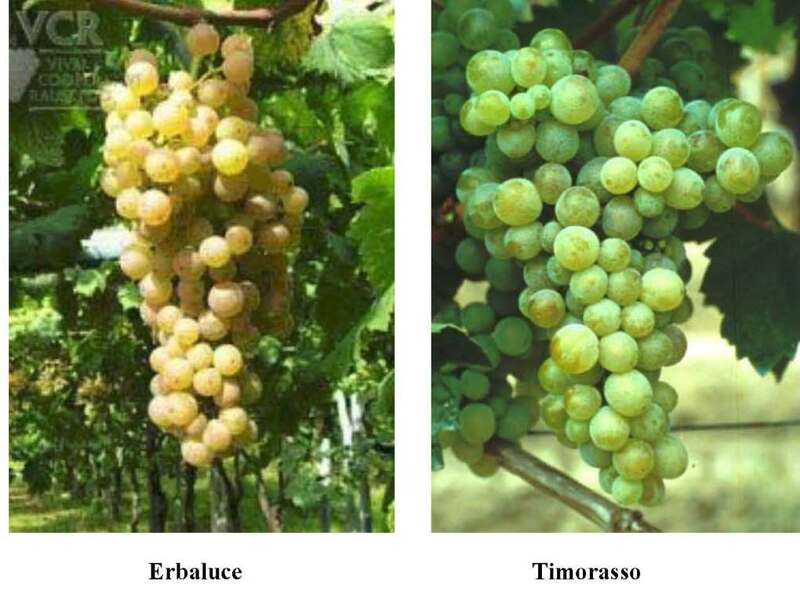 In the subsequent replanting, both varieties lost ground to the hardier, more generously bearing variety Cortese, to the point that Timorasso in particular was on the verge of extinction. Erbaluce is now the more widely planted variety, particularly around the town of Caluso, northeast of Turin. There it seems to have found an ideal location, and in the best hands it produces a lovely white wine that benefits from modest aging. Tom Hyland thinks it “one of Italy’s most prized indigenous varieties” (The Wines and Foods of Piemonte). It’s probably more accurate to say that it deserves to be such, since very little Erbaluce is now in commercial production – perhaps around 100 hectares? But those who know Erbaluce di Caluso esteem it, both in its dry version and its sweet. The dry is my preference: Light on the palate but far from insubstantial, with rich aromas of fruits and herbs – everything from mint to lemon to sage – and an equally complex and fascinating palate, it makes a lovely wine to sip with aperitifs and carry on with right through dinner. 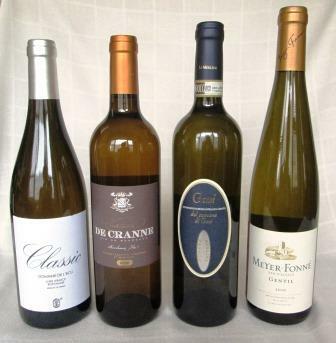 Some good producers are Antoniolo, Cariola, Cieck, Ferrando, and Orsolani. A quick check on Wine Searcher showed a good half dozen kinds (sweet, dry, still, sparkling) and producers of Erbaluce available within 20 miles of Manhattan, so it’s worth a look around out there. Timorasso is definitely too interesting a variety to be hidden in a blend. Even in youth, varietal wines have complex aromas of light honey and spice as well as floral, citrus, and nutty characteristics and a creamy texture – they sometimes taste as if they are lightly oaked even when they are not. 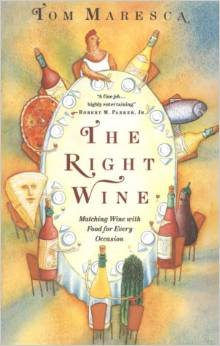 The acidity is fresh and well-made wines have excellent length, delicate minerality and surprising longevity. 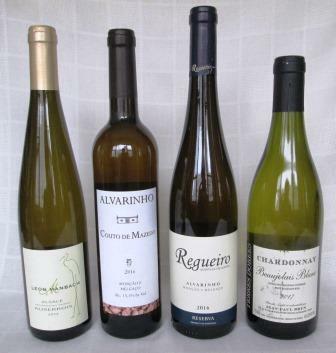 Producers of such wines include Luigi Boveri, Franco Martinetti, Walter Massa and Morgassi. Other good producers are Bava, di Marchi, La Columbara, Orsolani, and Vigne Marina Coppi. 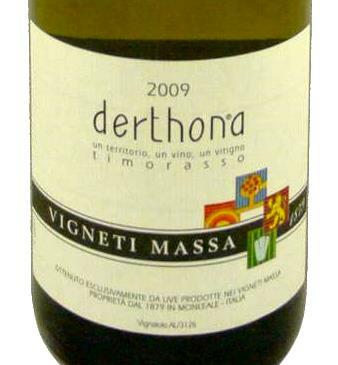 Most of these bottle under the name Derthona – Derthona is the old name for Tortona, the town that seems to be the epicenter for Timorasso production – but some use the Colli Tortonesi designation. Another quick look at Wine Searcher showed Timorasso from a half a dozen producers (including two I haven’t tried yet) available within 20 miles of Manhattan. 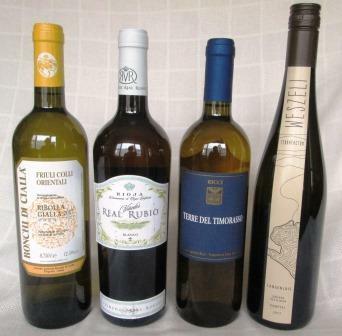 And, like the Erbaluce in this respect too, at very reasonable prices for white wine of this quality and interest. These two wines are already becoming far less rare in Italy, and I think their intriguing characters will soon win them a serious following here in the States.